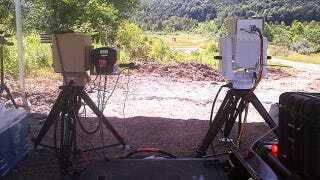 Boeing announced this week that it has successfully developed a new compact laser weapon system. And watch your back drones–because this one has been made with you in mind. This summer has seen an explosion in the number of incidents where drones have interfered with emergency crews doing their jobs. Most notably, drone hobbyists have been hindering firefighting efforts in California by jerks flying their quadcopters too close to the flames. Laser weapons have been used by US forces in both Afghanistan and Iraq, primarily for detonating IEDs from a safe distance. But those laser weapons are mounted on large trucks, while this new system is compact enough to be transported more easily. In the demo, Boeing used the laser to burn holes in a stationary, composite UAV shell, to show how quickly it can compromise an aircraft. Two seconds at full power and the target was aflame. Other than numerous safety warnings to ensure no one was blinded by the two-kilowatt infrared laser, there was no fanfare. No explosions, no visible beam. It’s more like burning ants with a really, really expensive magnifying glass than obliterating Alderaan. One of the appeals of laser weapons systems is their relative low cost. Once the system is built, all you’re paying for is the electricity to run it. And with a world of ubiquitous drones (military or otherwise) just around the corner, being able to deploy drone-killing tech on the cheap is vital. “This represents a low-cost way to deal with the threat,” David DeYoung, the director of Boeing Laser & Electro-Optical Systems told Wired. There are currently no plans to utilize the weapon on US soil, and it’s still a couple of years from seeing the battlefield. But if there’s anything we can count on seeing more of in the next decade it’s drones and lasers. And they’ll likely not be the best of friends.